Pop culture, TV, food, and a list of things I'm not cool enough for. 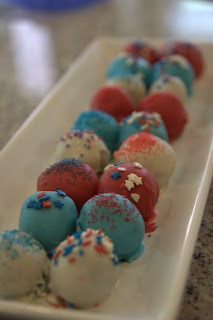 Husband went to a party not too long ago where someone had made cake balls and he wouldn't stop talking about them. I had eaten some from Holy Cacao that were pretty tasty, so I thought making some would be fun. We both had a day off (the kids did not get a day off) and so I started whipping up a batch. 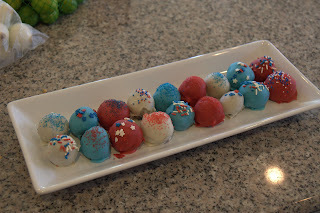 I'm making some for the 4th of July now, and thought I would share. Bake a cake (I've done this with both a chocolate and a yellow cake -- both were great). For simplicity sake, I made mine in a 9 x 13 Pyrex dish, because Pyrex is dishwasher safe and I am lazy. You can get a tub of icing, or whip up someone homemade icing. I made some from scratch (I'll share the recipe another time), which makes about three cups. Crumble up the cake and mix in the icing. Put the resulting goo in the fridge, overnight is preferable. The next day, get out a cookie scoop or some other scooping device, and scoop out the cake goo into balls. I rolled the balls in my hands, which was messy, but rounder. Put on a wax paper covered cookie sheet and pop into the freezer for at least 15 min. While the balls are freezing, melt some candy or chocolate coating. You can do this in the microwave or in a double boiler. I broke down and bought the Wilton Chocolate Pro melting pot, which has a melt and keep warm setting. It was a ton easier than my first attempt which involved using the microwave. Once you have a tray full, put them in the freezer for 15 min to cool and for the chocolate to harden. Peel off the wax paper and store in the fridge if you don't consume them all immediately. i am so into this right now.